Pawtucket Golf Club was originally a nine hole course layed out on 50 acres of land east of the Ten Mile River and alongside Armistice Boulevard and Brook Street. The land was leased from Herbert Sidney Daggett, a member of the 8th generation of the original Daggett family settlement. The first tournament was held on Labor Day, September 1, 1902. In 1917, the Club purchased all of the farm land from the Daggett family for $15,000 which was about 90 acres total. The course was expanded to 12 holes shortly after the land was purchased. A small clubhouse was erected where the 10th tee now resides. Then in 1923, then PCC President Frank Bishop and his board of directors decided to hire one of the most celebrated of the early golf architects, Willie Park Jr.
Willie Park in his younger days won 2 British Opens, was a club maker and ball maker. Pawtucket Country Club stepped into the front ranks of Championship courses when they hired Park. Park’s well-known United States courses include the Maidstone Golf Club on Long Island, Woodway Country Club in Darien, Connecticut, the New Haven Country Club in Hamden, Connecticut, the North Course of the Olympia Fields Country Club near Chicago (host of two U.S. Open (golf) events (1928 and 2003), as well as the 1961 PGA Championship), and The Milton Hoosic Club in Canton, Massachusetts. A. W. Tillinghast, famous for such designs as Winged Foot, Baltusrol, and Bethpage Black was hired in 1936 to perform reconstruction of the third green, a new fifth teeing area and rearranged the eight hole showing a rearranged green and properly bunkered and contoured for a 535 yard par 5 and also tile drainage for the fairway. The countdown begins to the Jim Tanner Caddy Classic as we celebrate the thirteenth year. We have raised over $100,000 and helped many deserving young scholars. This year we plan a few new challenges for our competitors. The format will continue to be one best ball of your foursome including gross and net prizes. The 5th with be closest to pin for all single digit handicaps and the 15th will be closest to the pin for handicaps of 10 or greater at 100%. We will include an individual champion for gross and net for your score in relation to your age. The scoring for the net will be at 100%. So, if you shoot 80 and your handicap is 10 your score is 70 minus your age. If your age is 60 then your net score will be 10. The example for the gross winner of closest to your age champion is shoot 85 minus your age of say 65, then your gross score would be 20. As always, we welcome all members, former caddies and friends of PCC to celebrate Jim Tanner’s wonderful career at Pawtucket. My bet is on JT to win the “Score your Age Contest”. Mungo Park describes the life and work of his illustrious ancestor. Some years ago, in 1995, I was lucky enough to play The Maidstone on Long Island, with club historian David Goddard. In a rare moment of golfing competence, I birdied an almost blind par three, designed by my great uncle, Willie Park Jr, to demoralise the overconfident. He had not reckoned with the last dregs of the family gene pool. I avoided the sea to the right, and the wide diagonal swathe of marram grass, lifting and falling in sympathetic motion. I watched in disbelief as my ball, to which I must have imparted, accidentally, just the right amount of backspin, bit and stayed on the crown of the tiny green, allowing me an easy putt. At the time I suspected supernatural intervention, but rationally I believe the original design of the Maidstone demonstrates the coming of age for the first golf architect to use the title. For Willie Park, course design was the art of the possible. It was not his role to punish the club player for having a high handicap, but he didn’t shrink from making life a little more difficult for the scratch player. His involvement at the Maidstone spans over 25 years, productive years for Willie in Britain, Europe, America and Canada. His example showed the way for many who came after. As a player and clubmaker, Willie, learnt his trade from family and surroundings. He was born in Musselburgh, the ‘cradle of golf,’ in 1864. His father, Willie Park Sr, had won the first Open four years earlier and, with Old Tom Morris, dominated the championship in its early years. His uncle Mungo (Old Willie’s brother) came back from the sea in the early 1870s and won the 1874 Open at Musselburgh, the first time it was played there. Old Willie won again the following year. Fifteen years later, in 1889, Willie Jr was to play, and win, in the last Open to be played in his home town, as the Honourable Company of Edinburgh Golfers moved out to Muirfield in 1892. Golf was growing enormously in popularity, but there was not a living to be made as a professional golfer alone, even with the money matches that were popular, so Willie Jr learnt his trade as clubmaker and ball hammer in the family firm of William Park and Sons, and practised putting with marbles on the brick floor of his father’s workshop. Willie was born at a critical time in the evolution of golf. The gutta percha ball had been invented just before he was born. This simple innovation transformed the game and indirectly led to the development of many new courses. The plentiful supply of relatively cheap gutty balls meant that golf was no longer the exclusive domain of the wealthy, as it had been when the feathery was the only adequate projectile of choice. Willie was born in the right place at the right time. In 1880 he had mastered his trade sufficiently to take the post of ‘assistant professional, club and ball maker, steward and green keeper’ at Tyneside Golf Club, in Ryton to the west of Newcastle, where his uncle, Mungo Sr was professional. Mungo had just laid out the course for the Thompson brothers, two expatriot Musselburgh men, but he returned to Alnmouth shortly after, and young Willie, aged sixteen, became the club professional. In the same year he entered his first Open, and came fifteenth. Four years later, in 1884, he returned to Musselburgh to help run the business. It is likely that his father’s health was starting to fail. In 1886, at 22, he laid out his first course at Innerleithen. He did not charge a fee, but instead obtained a preferential ‘franchise’ for the supply of William Park and Sons clubs to members. Fortunately for the profession, course design as a loss leader did not catch on! But it was the start of Willie’s rise to prominence in course design. As a golfer Willie was approaching his best. In 1887 he won his first Open, and two years later, his second. After that, business took over from playing, to a great extent, as he built up the name and reputation of William Park and Sons. From 1890 Willie was effectively in charge of the firm. He opened branches in Edinburgh, London and Manchester, and in 1897 he opened a branch in New York. The 1890s too saw a great demand for Willie’s skill as a course designer. In 1892, it seems likely that Mungo Sr and Willie Jr collaborated with Davie Grant of North Berwick to design and construct the course at Silloth on Solway. This was and still is a fine course, although it is much changed by a series of prominent architects. Bernard Darwin said: ‘I never fell more violently in love with a course at first sight’. In the same year as Silloth, Willie was working at Jedburgh and Peterhead. His comments show a thoughtful, confident mind, with clear design ability and a good working knowledge of agronomy and greenkeeping. “Rolling however, requires to be carefully done. In dry weather it is only good for polishing the surface, and if done too frequently may render the green so keen and fast as to make putting an impossibility.” With minimal intervention an expedient and economical way to build, Park’s courses concentrated on the celebration of natural topography and ecology. He employed high quality construction professionals and shapers, and, although he moved the design process from ‘walking the course’ to ‘planning the course’ he never lost his ability to use and enjoy the form and articulation of landscape, with the insertion of a little artifice to make a hole more challenging. His par threes provide a library of devices by which to snare or disorientate the golfer. Often he used a diagonal hazard to distract the player, or to provide an artificial perspective to a hole. Transverse diagonal ditches or streams, as at Stoneham, or heather covered banks, as at Sunningdale are typical, but Willie was happy to try new devices, as at Aldeburgh, which he designed with James Braid, where a small cliff of vertical timber sleepers at the back of a long horseshoe shaped bunker contains the par three fourth green, reached over a landscape of brutal and engulfing gorse. 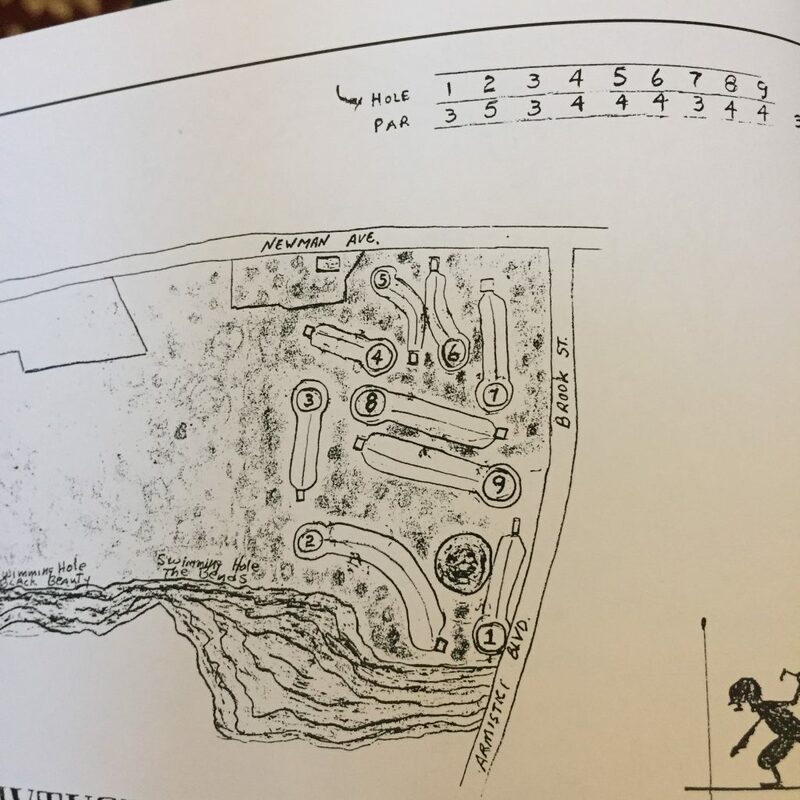 Willie’s greens were typically described as “a tipped platter with two fried eggs,” but like Colt, MacKenzie and Simpson, the next generation, he preferred to allow the strategy of the hole and the green’s location to inform its design, with as little help as possible from the construction team. Willie never embraced the ‘penal’ philosophy. As Geoffrey Cornish wrote to John Adams (The Parks of Musselburgh, Grant Books): “It is evident to me that Willie Park was practising strategic design in Canada and the US during his 1916-23 years… whether or not the words strategic and penal were being used at that time in relation to design.” The Game of Golf argues sensibly for the strategic approach, as the only practical way to cater for the diverse ability of golfers. Willie was in all things a pragmatist. By 1900 Willie was at the height of his powers. He had designed and built Sunningdale, which opened to universal acclaim, and he had set up his own development company, Chiltern Estates, to build a new course and housing at Huntercombe. This too was greeted with critical acclaim, and the present course, substantially unchanged, is a testament to the quality of its early design. But the success of the design and construction of Huntercombe was to be transformed into a bitter failure. By 1906 it had passed into the possession of the Norwich Union Life Insurance Company. This was a difficult time, but Willie continued to build, particularly around London, and on the Continent. After Huntercombe was lost he poured himself into work, and before the First World War he was at his most active and influential. Among a long list, he worked at Royal Wimbledon in 1907, West Lancashire, Temple, Lauder and Biggar in the Borders and Grantown on Spey further north. Nieuport Bains, Mont Agel (Monte Carlo) and Royal Antwerp were also carried out in this period, and Killarney in 1911. With the onset of war there was little to be done in Britain or Europe, and few people to do it. In 1916, thus, he went again to New York, where his younger brother John was already professional at the Maidstone. Willie developed the office of ‘William Park – Golf Architect’ with the same energy and application as in Britain. Between 1916- 1924 he built some of his best courses in North America and Canada. They remain a testament to his skill and aptitude. This legacy may be as significant to the overall history of golf architecture as his designs. His work at Sunningdale and Huntercombe inspired Colt, Abercrombie and many others. They demonstrated that successful new golf development of the highest quality was possible on inland sites. His work in America and Canada confirmed his position as the father of golf course architecture. Inevitably it is his built legacy for which he will be remembered, and it is a testament to the quality of his courses that so many remain relatively unchanged. Gullane, Huntercombe, Sunningdale, Mount Bruno, Ottawa, the Maidstone, Olympia Fields, Royal Antwerp, Mont Agel, Killarney and many others are a substantial legacy, but so too are lesser known gems, such as Silloth, Kilspindie, Aldburgh, Temple and Stoneham, where the great Willie Park encourages lesser mortals to practice the art of the possible in subtly considered landscapes, and to achieve, from time to time, those satisfying moments of unimportant personal greatness. Mungo Park is an architect, specialising in clubhouse design and refurbishment. He is the great-nephew of Willie Park Jr, and the great-grandson of Old Willie Park. Any information on Park designed courses from clubs or club historians will be gratefully received by e-mail info@mungo-park.co.uk or telephone +44 (0)1684 274848. This article first appeared in issue 14 of Golf Course Architecture, published in October 2008.
: This year’s recipient of the Jim Tanner Burke Fund Scholarship is Jessica T. Moszkowicz. 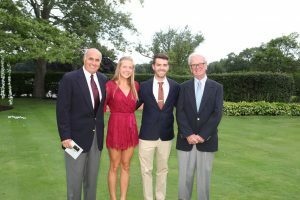 She was nominated by the Pawtucket Country Club, and is in the Class of 2020 at Villanova University. The other Burke Scholar in the photo is Hans Bengtson, who is in the Class of 2020 at Johnson & Wales University. Paul Rego is a long time member of Pawtucket Country Club and a member of Burke Board and is standing to left in picture. JT is on right. PAWTUCKET – Rod MacKenzie is in his early 60s now, but his mind often drifts back – especially at this time of year – to all of the days he spent as a caddy at Pawtucket Country Club decades ago. “It was just like ‘Caddyshack’ in a lot of ways,” he laughed recently about the sometimes incredible, sometimes comical and at times emotional moments they had tending the bags of club members on the links – or while waiting for a loop. MacKenzie, now a businessman living in North Smithfield, isn’t alone. Back in 2007, some of his old buddies were so enthused about organizing a reunion of sorts, they decided to organize an event; it would be one where PCC caddies from an era long past would get gather, play 18 holes and – most importantly – share their fondest memories. On Monday afternoon at 1:30 sharp, over 90 ex-caddies, former and current members and friends of both will congregate to put on the 12th annual Jim Tanner Caddy Classic, the event naturally named for the legendary former PCC assistant golf professional and current caddy master. The tourney, a shotgun start, will include several notable “guests,” among them Tanner himself; Providence College Associate Athletic Director Carl LaBranche and his wife Joann; Les Kennedy Jr., the son of the longtime Pawtucket golf pro; and Mike Gelinas. The event, including a silent auction with dozens of interesting items up for bid, will help raise money for the John P. Burke Memorial Scholarship Fund. “I’d never miss this; it’s part of my heritage,” MacKenzie insisted. “The guys who come back want to get together with old friends and catch up, but also reminisce about all of the things we went through as boys and teens growing into young men on that golf course. “We started this tournament because we wanted all of the guys to come back for a great day,” he added. “It was a guy named Kevin Fortin who suggested back in 2007 that we contact a bunch of those guys and have a tournament, and it was Eddie Emond’s idea to name it after J.T. “We had 24 ex-caddies gather in November of 2007 to celebrate our common experiences of caddying and golfing the summers of our teen-age years, and the PCC Board of Directors waives the greens fees so we could have more money for foodand prizes. We paid $75 per person that first year, and this year it’s $150 a golfer. Whatever money is left over from expenses goes to the Burke Fund. “I remember, all the guys showed up on a Sunday – it didn’t start until 3 p.m. – and we had so much fun we didn’t leave until the kicked us out. The next year we had 68, the year after that 132. I think the biggest showing we ever had, I don’t know how many we had, but we had to schedule a double shotgun for, like, 8 a.m. and 1 p.m.
“What have we accomplished the past 12 years? Well, we’ve raised over $80,000 for a dozen deserving young men and women (not only caddies but also club employees, etc.) from Pawtucket and surrounding communities. Most of our donations go directly to the Burke Fund. He also indicated that PCC has enjoyed a recent revival with many new members and their families, and those who benefit from the Tanner or a Burke scholarship have learned some key information about the former’s legend. “Jim started out as a caddy in the mid-1950s and became the assistant professional to Les Kennedy (Sr.) in the 1960s,” MacKenzie noted. “With a growing young family, J.T. took the position of Caddy master at Pawtucket and continues today in that same role. “He since was inducted into the Pawtucket Country Club Hall of Fame in 2001, and they gave Jimmy an honorary membership for the rest of his life. In 2009, he was inducted into the Professional Caddies Association Hall of Fame, and that ceremony was in Orlando (Fla.). He’s also been (enshrined) by the R.I. Golf Association (that in 2014). MacKenzie himself began caddying at PCC in 1967, doing so on a whim. “I was a Pawtucket Times’ newspaper carrier, and I had 96 customers in all,” he stated. “A friend of mine, Jack Early, stopped me one day and told me I could make more money caddying. I thought he was nuts, but I looked into it. “I went to my dad, Frank, and said, ‘Uh, Jack said I could make more money caddying at Pawtucket than delivering the paper,’ and he just said, ‘OK, prove it!’” he added with a laugh. “I went to the club and introduced myself to J.T., and he asked who had referred me, and I told him. I didn’t get out for a loop right away. You had to pay your dues like everyone else, so I waited about two weeks. MacKenzie also recalled going to the course to make money, or play, grew on him quickly. He explained that when he was in ninth grade at Goff Junior High in 1969, he would tell his homeroom teacher that his first class was study hall, but he wanted to go and learn how to type. That actually was, common back then. It didn’t take long for MacKenzie, he said, to earn the nickname, “Super Looper,” and eventually became Tanner’s assistant caddy master after four or five years. MacKenzie, who had attended Tolman High before graduating in 1973, then moved on to Boston College, used his money for gas or dates, and to help put himself through school. “Jimmy was a fun guy,” he said. “He took care of me, giving some of the best loops (golfers) out there. I remember once, it was the day before the R.I. Open, and I had said, ‘Jimmy, give me a ham-and-egger early in the morning because I’m going to caddy for Ronnie Quinn (one of the tourney favorites).’ He wasn’t going out until, like, 2 (p.m.). MacKenzie had long been gone and begun his professional life when Tanner informed him of another humorous incident. “Jim said he had put a kid on a bag at the R.I. Open at Pawtucket in the early ‘90s,” MacKenzie chuckled. “Apparently, there were three guys who were all battling for the championship, and they were on (No.) 18. “One of the competitors was on the fringe, and his caddy wasn’t tending the pin for him, like he should’ve been,” he continued. “Jim said the caddy all of a sudden ran to it and pulled it out at the last second. As it turns out, in medal play, that was a two-shot penalty, which took the golfer out of contention. He would have to be assessed. “(After a commotion), they went to the tournament director, and he (allegedly) told the three guys, ‘OK, just go play 18 again!’ As Jim was telling me this, we were both laughing like heck. It was the summer of ’72 at Pawtucket Country Club and Amie Smith was frustrated with some of the members filling in their score cards after the round was completed. The members would be filling in the score cards over a beer or two trying to remember what the score on a hole they played several hours past. As you might imagine the scores recorded often would be a few shots more or less than actually played. The solution was to provide the caddies with their own score cards to record the scores as each hole was played. The cards were green in color so they would not be confused with the members “official” white scorecard. This was not a great solution and would not have been implemented if the member caddy relationship was carefully considered. The caddy was asked to record an accurate score on each hole played by the members. The same members that would be paying the caddy his wages which typically would include a tip for good service. So, the caddy would ask his members, “What would you like to take on that hole?” before the scores were recorded on the special green scorecard. The new scoring program was cancelled after a few weeks and many winks and laughs. Mark it on your calendar. It is hard to believe that time has passed so quickly. More than 900 rounds have been played honoring Jim Tanner. We have provided 10 scholarships and raised over $80,000. The Burke Fund established a scholarship in Jim Tanner’s name in 2010. Jim Tanner was inducted into the Professional Caddies Association Hall of Fame in 2010 and the Rhode Island Golf Association Hall of Fame in 2015. A clock was installed at the Pawtucket Country Club putting green in 2016 to commemorate Jim Tanner’s accomplishments including over 60 years of service to the club. Jim has been at the club most every day during those years and still welcomes members and guests today. I hope you will join us in 2018 and celebrate one of the great traditions at Pawtucket Country Club.